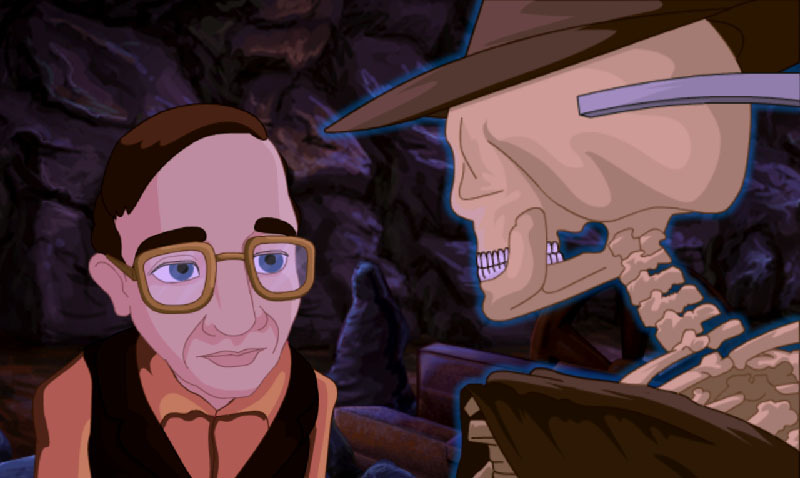 Al Emmo and the Lost Dutchman’s Mine is a game that was originally published in 2006 by the team who brought us free King’s Quest I-III remakes and a Quest for Glory II remake. They were ADG Interactive at the time, and you can still get all those remakes here. They’ve since renamed themselves Himalaya Studios and are currently working on Mage’s Initiation, a game that was successfully funded through Kickstarter in March 2013. Somewhere in between their busy schedule, they managed to produce a remastered version of Al Emmo. Not your typical hero, but reminiscent of Larry Laffer. When the game begins, Al is on his way to Anozira (not a typo for Arizona…this is a fictional town) via train to pick up his mail-order bride. Unfortunately, she realizes that Al has no income and no prospects, so she takes off on the last train out of town for a while. Al is stranded with no money and nowhere to go, so there’s nothing for him to do except explore Anozira. He falls for Rita, a singer at the local saloon, forgets all about his mail-order bride, and sets off on a quest to woo her. The characters are one-dimensional caricatures and are difficult to relate to or sympathize with. Al Emmo is a decently long game, with nine acts in total. New features of Al Emmo‘s enhanced version are a new voice actor for Al Emmo, 2D-animated cutscenes, 20 achievements, a Sierra-style scoring system with 500 points to win, higher-res graphics options, and UI/graphical tweaks to enhance gameplay. I am unable to compare this edition with the original, as I have not played it. 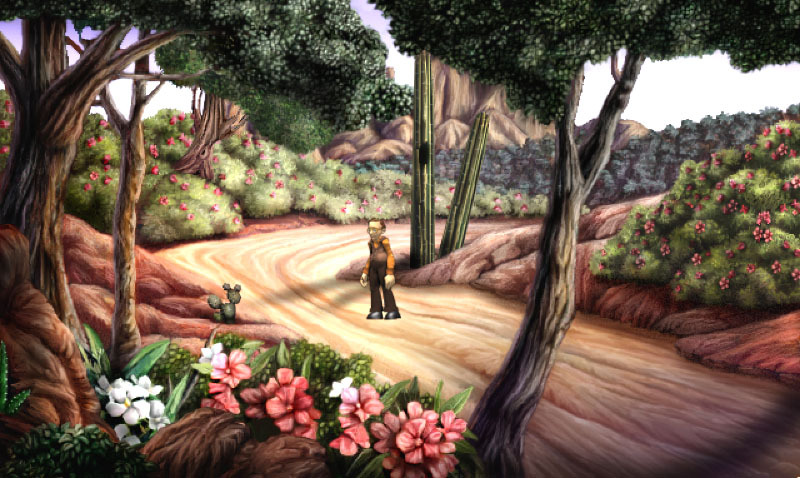 The graphics are a mixed bag; all of the environments and 2D artwork are well-drawn, but the characters seem very out of place within the environments – they’re 3D in a 2D environment. The art styles don’t blend well, and the animations are particularly bad. Unfortunately, I can’t stand the voice actor for Al. I understand he’s supposed to be a stereotypical nerd, but the whiny, nasally, high pitched voice drove me nuts, and since he’s the main character you’re going to hear it the entire game. The narrator, however, is pretty great – his overall demeanor reminds me of Stan from the Monkey Island games, and his snark is on point. He can get a little over the top, but that’s part of the fun, and he was my favorite part of the game. Everyone else is in the passable to good range – there are some questionable Southern accents, but I suppose you could pass it off as an effect of being in a fictional land. The soundtrack is excellent, and I wish there was more of it; it fits the Western atmosphere perfectly. This adventure takes more pages from the books of Sierra games than anything else, which makes sense based on the previous projects from Himalaya Studios. There’s no way to highlight hotspots; this is old-fashioned pixel hunting at its finest, which might bother you if you aren’t used to that style of gameplay. Almost everything you see on-screen is able to be interacted with, and everything has a reaction from the Narrator, Al, or both. You cycle through the move, look, touch/use, and speak interactions with your right mouse button. The inventory lives in the top right of the screen, under a menu button. Later on, you’ll also get a map, but it doesn’t show every location in the world, only the major ones. The environments can get very confusing, and I found myself wandering aimlessly a lot of the time. You might even want to make an actual paper map. Dialogue is a little different in that A) you have no choice in what you say and B) you have to talk to people multiple times in a row to hear everything they have to say. I must say I prefer the standard dialogue options list, where you can exhaust all your topics and it’s easy to tell when you can walk away – it’s easy to miss things with this style. Double-clicking will make Al run instead of walk, and hitting escape when you’re exiting a screen will make you skip the walking/running animation altogether, which saves time (and saves you from looking at the awkward animation). 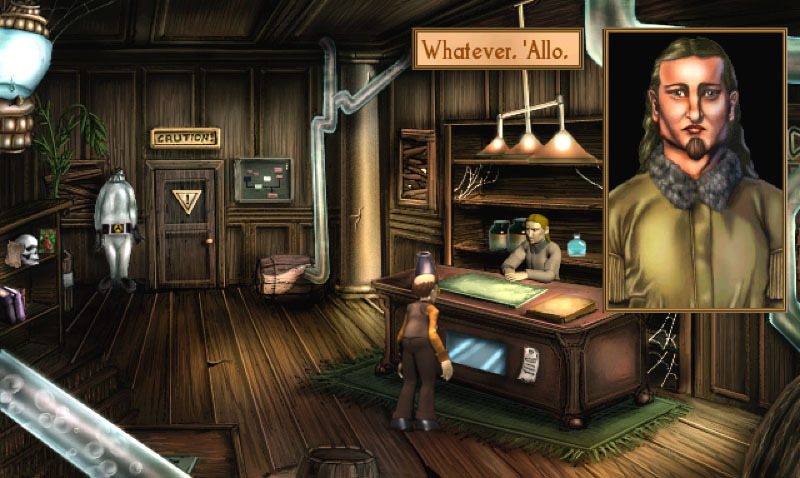 The major issue I have with Al Emmo is the puzzles, which make or break an adventure game. Too often, I was left with only a vague idea of what to do and too much area to wander aimlessly in, resulting in a lot of frustration. The puzzles themselves are logical, but sometimes figuring out that there is a puzzle somewhere is the obstacle. Sometimes I would solve something without realizing it. There’s also a lot of inventory collection and combination, and sometimes this is illogical as well, or something that should work doesn’t work unless it’s in the “correct” order – for example, when making a fishing pole, you have three inventory items to combine. You can’t combine item one with item three, or item two with item three, you have to combine them the way the game wants you to. That might discourage you from the correct idea. Generally speaking, a lot of the puzzles and mechanics just didn’t work for me – it may be that I’m more of a LucasArts adventure fan than a Sierra adventure fan. 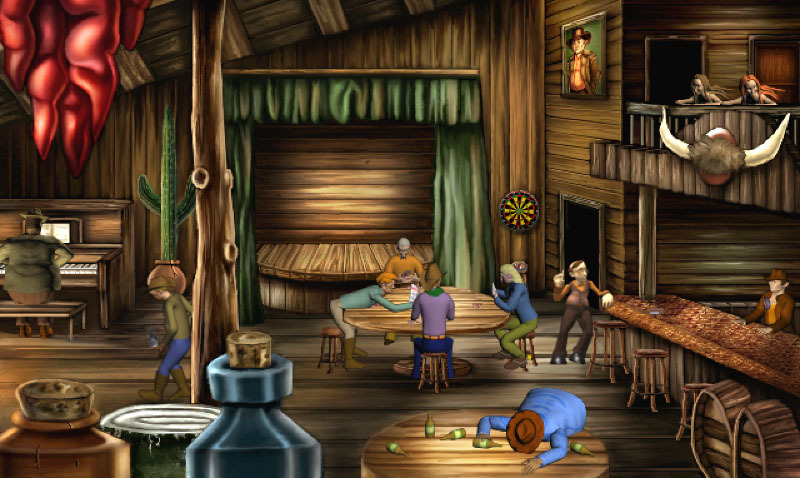 A lot of attention to detail has gone into this game, but the puzzles were often obscure and the majority of the humor (besides the narrator’s snark) never landed for me. The dissonance between the two graphical styles is distracting, and I didn’t get invested in the plot. I would suggest picking another game, but there is a demo available; maybe you’ll like it more than I did. Vote for the game on Greenlight here. Visit the official site, and follow the team on Facebook, Twitter, and YouTube. Get the game from Desura, Zodiac, Himalaya Studios, and IndieGameStand. Base price is $9.99, and on IGS you can get the soundtrack for $2 more.